The canine endometrium is frequently affected by severe alterations with unclear pathogenesis and is, therefore, an important subject of research in veterinary gynecology. Therefore, the aim of our study was to establish a three-dimensional in vitro system of the canine endometrium suitable for experimental approaches. 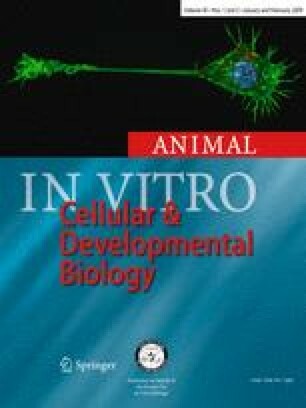 For this reason, intact uterine glands were isolated from canine uteri and placed together with stromal cells on culture dishes coated with several extracellular matrix components (collagen I, IV, fibronectin, laminin, gelatin, Matrigel™) for up to 4 d to support differentiation of cultured cells. Immunohistochemical detection of laminin on freshly isolated glands showed a partial preservation of the basement membrane—an important factor for epithelial differentiation. Glandular structures were differentiated and polarized during culture time as shown by electron microscopy. Signs of degeneration and loss of cell–cell adhesions as seen occasionally on day 4 depended on the individual dog. In general, morphology was best preserved on Matrigel™ matrix. No significant changes of cultured glandular explants were observed concerning proliferation and steroid receptor (estrogen, progesterone) expression when compared with the original uterine tissue as assessed by immunohistochemical staining. Lectin histochemistry revealed comparable results for the in vivo endometrial glands and the cultured glandular explants during the whole culture period. This in vitro reconstitution of the canine endometrium is a promising tool to study the cyclic events in the normal endometrium as well as alterations in the affected uterus. The expert technical assistance of Sonja Dolezal and Magdalena Helmreich is greatly acknowledged. The work of Katharina Stadler was supported by the vonFircks scholarship at the University of Veterinary Medicine, Vienna, Austria.